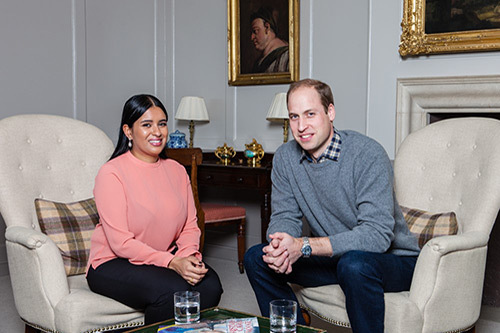 Journalism student Sophia Kichou has interviewed Prince William for the national magazine The Big Issue. Sophia, who is a final-year student on the Journalism BA programme, was invited to Kensington Palace to speak with the Duke of Cambridge. Prince William kept a promise that he made to the student four years ago, telling Sophia that one day she could interview him. The pair first met when Sophia was staying at a hostel run by the charity Centrepoint, of which the Duke is a patron. With the support of Centrepoint, Sophia was able to begin her studies at City and earlier this year was honoured by the Prince for her achievements at the charity’s first-ever awards ceremony. The Duke talked about why Centrepoint is a charity close to his heart and his memories of visiting hostels with his mother, Diana, Princess of Wales. He also discussed how the issue of youth homelessness has changed in the decade he has been Centrepoint’s patron. In a personal insight, he talked about his two-year-old son Prince George and seven-month-old daughter Princess Charlotte, and how they would spend Christmas as a family. The exclusive interview was published in the Monday 7th December edition of The Big Issue, which is sold by homeless people.